Say what you like about the disastrous, racist, disenfranchising, deeply depressing, and potentially planet-destroying presidency of Donald Trump, but at least it’s brought us one ray of glorious, pitch-black light: The rise of Melania Trump, Goth Queen Of Christmas And All The Blasted Lands. 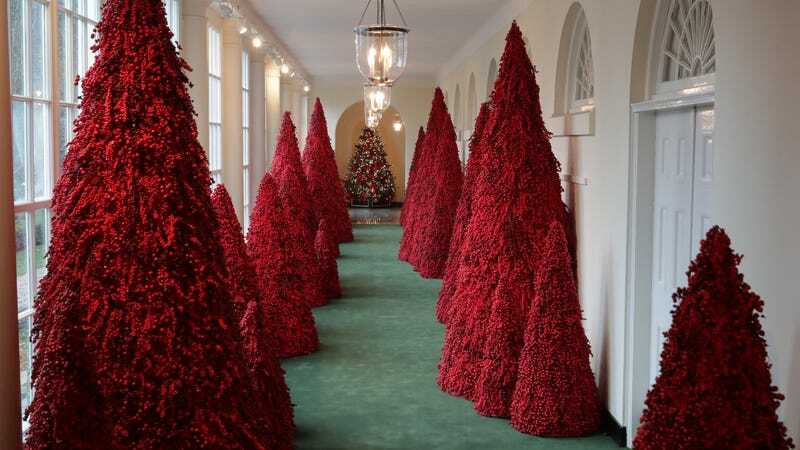 Last year, the First Lady Of Santa-Adjacent Horror graced the White House with a Yuletide theme best described as “The witch’s forest, ere the mewling star-spawn’s rise,” but she really outdid herself this holiday season, when she brought the blood trees home to roost. Much has already been made online of the conic, Lovecraftian horrors, which look like they’re perpetually one mis-timed back turn away from lashing out with a tentacle and incorporating some poor White House cleaning person into their ever-expanding biomass. And sure, some might argue that the trees look like Christmas decorations from a planet where The Thing won, or like they’re about to spawn hundreds of tiny mouths, all gently whispering “Join us” on a frequency both imperceptible and irresistible to the human mind. But Melania still thinks they’re pretty nice!